You need to evaluate your current sales and marketing structure. It could be costing you millions. Every organization has a sales funnel. From startup to IPO, you have a way of selling to potential and current customers. Are you hitting all your goals? Is your budget generating the right number of leads? The process for converting a lead into a customer is a mystery to most organizations. As we mentioned before, we took years in developing our strategy to accurately reflect how people think. We love the brain and people and decision-making. Modeling our process from the research done by scholars James O. Prochaska and Carlo Di Clemente, we designed not only a process for how prospects buy but an analysis to evaluate your current marketing tactics, guide you in creating the right content, resource your sales team and create a unique process that best suits your needs. 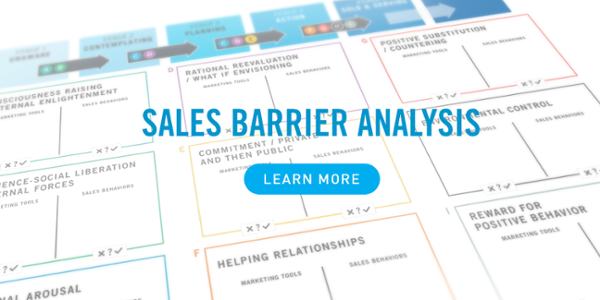 We offer a Sales-Barrier Analysis to clients who are interested in improving their sales and marketing process. The issues go on and on. Do you need help with any of the following? To learn more about the Consumer Decision Journey and how your organization can benefit from implementing this process, download our whitepaper.